Remember that couple from Indiana that visited all of the Cracker Barrel locations? Yeah? That’s me with Jersey Giant Subs. I mean, obviously there’s not 645 JGS locations, but I still can’t pass one up when I see it. I’ve been working a lot on weekends recently which takes away from family time. J has been pretty understanding because she knows the weekend work is stuff I really like doing while the weekday stuff is not always my favorite thing to get up in the morning for. This past weekend, I was heading to Ann Arbor in the afternoon and would be gone the rest of the day. I got up fairly early for me (on a Saturday anyway) to spend some time with the kids before I left. They were asking right away if we could go to Jungle Joe’s for a little while and I didn’t see any reason why we couldn’t. J decided to stay home for a little quiet alone time (something she rarely gets) and asked if I’d pick up lunch on the way back. 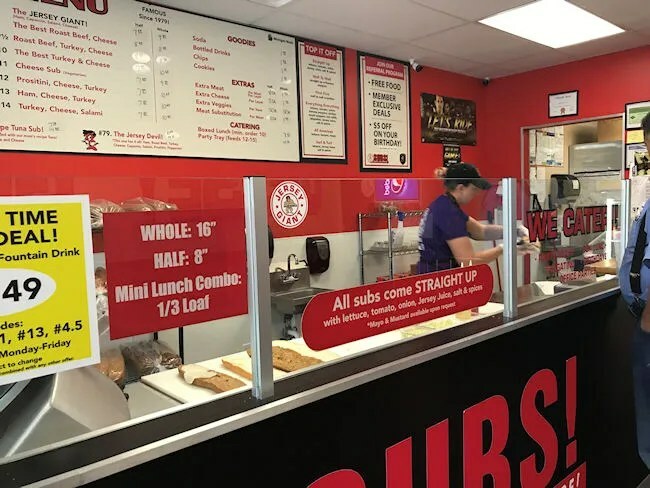 My brain immediately went to Jersey Giant Subs because I knew we’d be close to one that I haven’t been to yet. The Sprinkle Road location of Jersey Giant Subs is in a small strip mall on the corner of Sprinkle and Milham Road. It’s in the same shopping plaza as Jaspare’s Pizza and Great Wall Express. The restaurant is set up like all the other Jersey Giant locations. The decor is minimal but loud with a bright red chair rail and large letters spelling out the restaurant name on the wall. Ordering is done at a counter where the meats and cheeses are sliced fresh. There’s a rack of fresh baked bread waiting to be picked for a sandwich. The large menu hangs on the wall behind the counter with all of the combinations JGS has already picked out for you. 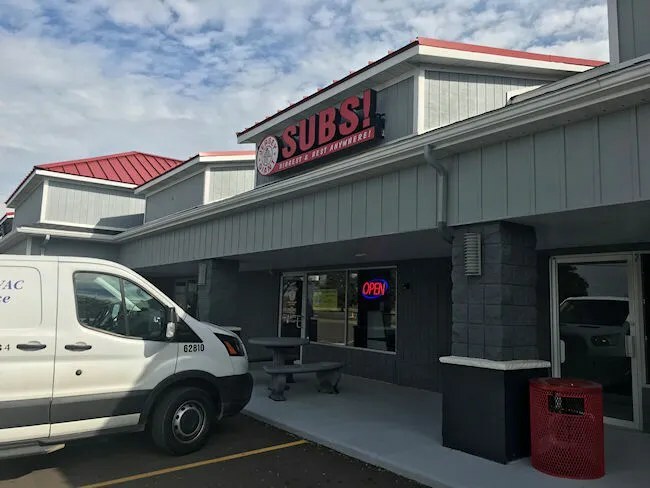 I was only ordering two subs despite having the kids with me. Neither one of them really does well with sandwich places so I was going to hit McDonalds on my way back home. 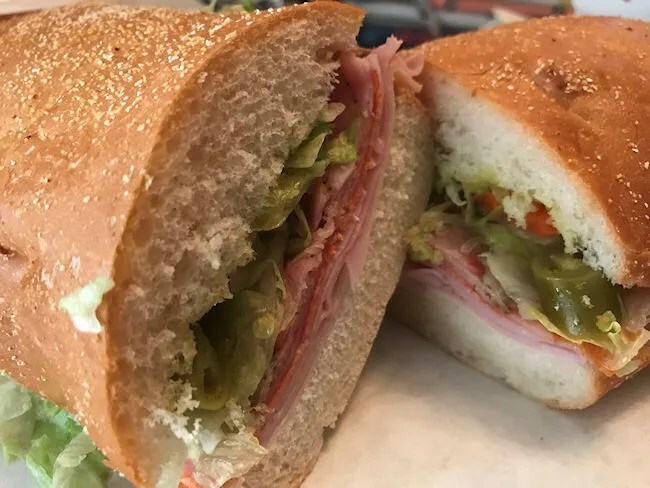 I just had to pick up lunch for J and I.
I ordered myself a whole (16″) #6 which goes by the name “The Boss.” For J, I ordered #13 which is Ham, Turkey, and Cheese. If you’ve ever eaten in a sandwich shop anywhere in the country, you essentially know the deal. 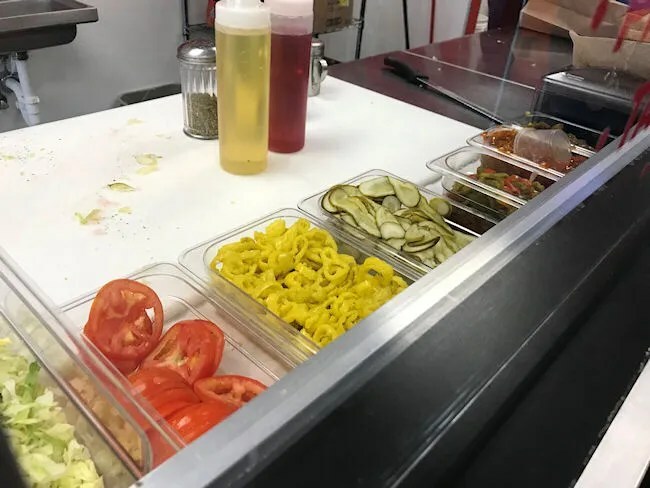 You order the sandwich, the base meats and cheeses are added, and then you get to pick which “free” veggies you want to top the sandwich. Jersey Giant does it the same way, but there are only a few veggie options compared to other places, but they’re all fresh and they’re really only the essential things you need to make a delicious sandwich. The #6, my sandwich, starts with Provolone cheese then is topped with ham, capacola, prostini, salami, and pepperoni. I keep my toppings simple with just lettuce, salt, pepper, oregano and two ingredients that make Jersey Giant special. The first is the Jersey Juice. It’s just a combination of oil and red wine vinegar but man does it make the sandwich just pop. The other, and this one isn’t available at all JGS locations, is hot giardiniera. This addition costs $1 but it’s so worth it. The pickled vegetables add a little kick to the sandwich and add on even more vinegar. I get sandwiches without it when I’m at a JGS outside of Kalamazoo, but the sandwiches are just taken to a whole new level with it. J’s #13 starts with the same Provolone cheese but it’s topped with fresh sliced turkey and ham. She chose the wheat bread for her sandwich while I stuck with the white. Her choice of veggies included lettuce, pickles, salt, pepper, oregano, and, of course, the delicious Jersey Juice. We both at just half of our sandwiches before putting the other eight inches in the fridge for later. The two sandwiches cost me $25, but we each got two meals out of that. 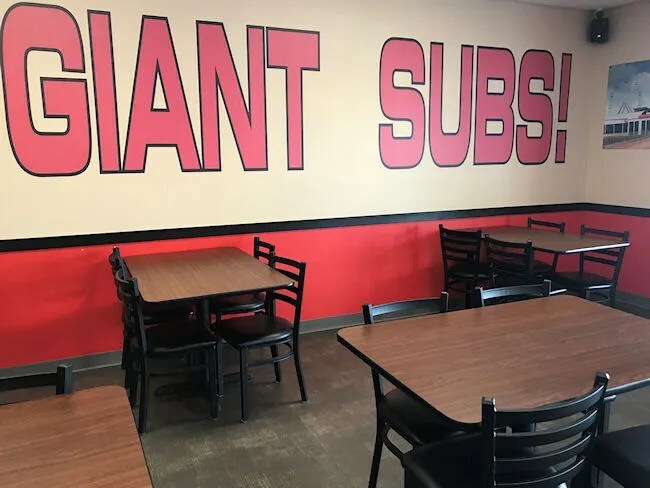 I will never get tired of Jersey Giant Subs. There are other sandwich chains, sure. 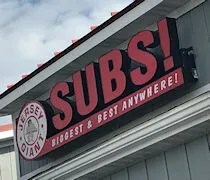 Some of them get the food to you pretty fast and others have a much larger menu, but Jersey Giant is always incredibly satisfying.